In this video blog, I will demonstrate four different abdominal exercises for osteoporosis. Each of these exercises for transverse abdominals is part of my Exercise for Better Bones program. Let’s start with the Abdominal Exercise for Beginner Level. The Abdominal Exercise for Beginner level in the Exercise for Better bones program. It targets the transverse abdominal muscles and the spine. It is the first of four abdominal exercises for osteoporosis. You might want to have a small towel handy or you can use your own hand in the small of your back. Come down safely onto your side and then roll onto your back. You want to place the towel in the small of the back or else your hand. I prefer a towel because it gets you out of this forward roundedness position and then you can just focus in on your deep abdominals. Use the heel of your hand at the base where your thumb is and place that across your two hip bones, so each one on either side. Then allow your thumbs to point down towards your groin. You’re going to have your knees and your feet hip-width apart. Take a nice breath in and then slowly, gently exhaling, you want to start tightening your pelvic floor ever so gently. Then, you want to then move up and feel as though you’re pulling your two hip bones together. You should feel the muscles underneath your thumbs start to tighten up. This is what we refer to as recruiting your deep abdominals, or engaging your deep abdominals. That’s something that you should have taken with you with all the exercises, but now I’d like you to start building the endurance of those muscles, so being able to hold them for 5, 10, 15 seconds. Let’s do that again and this time we’re going to hold it through several breaths. Start by tightening your pelvic floor through exhalation, and then tighten your deep abdominals by pulling your hip bones together. For some people, pulling them apart is another cue that seems to work. You’re drawing your belly button towards your spine. You want to keep that firm, even as you’re breathing, even as you’re talking. You want to hold that firm throughout so that you’re building the endurance of those muscles. Doing that on your back is a nice way to start, but ultimately, you want to be able to do that whether you’re standing or sitting, or in any position, so that as we progress through the exercises, you’re able to use your deep abdominals through all the exercises for stability. 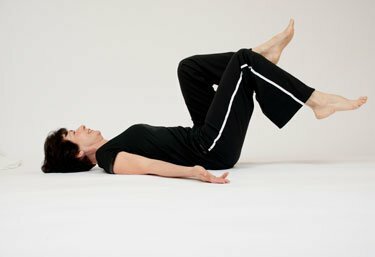 The Abdominal Exercise with Leg Drop for Active level in the Exercise for Better bones program. It targets the transverse abdominal muscles and the spine. It is the second of four abdominal exercises for osteoporosis. Have a small rolled towel that’s going to be the size of your hand. Place in the small of your back. Go down to the side, onto your back, and ensure that it’s right in the hollow of your back. Either use your hands to feel your deep abdominal muscles just inside your pelvis, or allow your arms to rest down by your side. Bring one knee up towards your chest, so a little bit past 90 degrees, and then join it with the other knee up towards your chest. 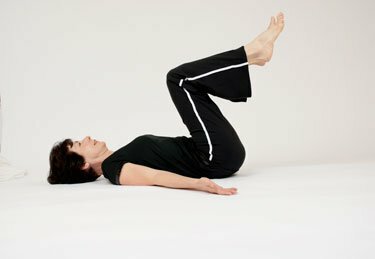 Now, in this position, your pelvis will be tilted slightly, which is actually going to help your abdominals initially. Take a nice big breath. Slowly, gently, tighten your deep abdominals. S tart by tightening your pelvic floor and you feel as though you’re pulling your hip bones together. The objective here now is, you’re going to be lowering one leg towards the floor, but you do not want the small of your back to lift off of the towel. You want to keep that same amount of pressure on the towel the entire time. Breath in, gently tighten your pelvic floor and your deep abdominals as you come down, and back up. So think about your lower tummy, breath in, engage or tighten your pelvic floor and your lower tummy, dropping one leg towards the floor, and then back up again. And you’re going to repeat. If it’s challenging to do it alternating, you can certainly start by doing the right side only for five repetitions and then the left side only for five repetitions. If at any point you feel, “My abdominals are giving out,” and you can’t hold that position anymore, just take a break and then start over again. The Abdominal Exercise with 90/90 Leg Drop for Athletic level in the Exercise for Better bones program. It targets the transverse abdominal muscles and the spine. It is the third of four abdominal exercises for osteoporosis. If you don’t want to use your hand, you can just use a small towel. Again, the size of that towel should be pretty well the size of your hand, both in with and depth. D own your side on to your back. The towel should be adjusted to the small of your back. Raise one leg to 90 degrees, the other leg to 90 degrees. Keep your abdominals nice and tight, don’t let your low back drop. Keep your tummy firm the whole time and engage your pelvic floor as well. The angle of your thigh is going to change the intensity of this exercise. 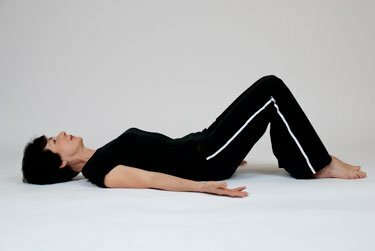 So if you’re doing the exercise and you find that you’re not quite able to maintain that neutral position where you’re just keeping nice and firm in here, you can always assist until your abdominals get stronger by altering your angle, bringing your knees a little bit closer to your chest. The closer your knees are to the chest, the lesser the load. The farther your knees are from your chest, the greater the load. So that’s a nice way to be able to adjust the intensity of this exercise to fit you. That’s it for the athletic level. 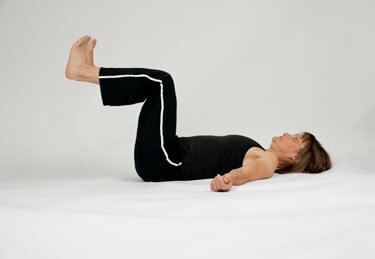 The Advanced Abdominal Exercise Leg Drops is a strength exercise from the Exercise for Better Bones program specifically designed for the Elite Level.It targets the transverse abdominal muscles and the spine. It is the third of four abdominal exercises for osteoporosis. Either your hand or a towel that’s the size of your hand in the small of your back for this exercise. Start by raising one leg then the other leg. As in the athletic level (above), you can fine-tune this exercise by how much hip flexion you allow yourself in the resting leg. Now on this level, we’re going to increase the intensity by increasing the load of the weight, by straightening the leg like this during the motion. We either repeat on the same side…or we can alternate side to side. Another way of adjusting this exercise is how low you allow this leg to come. If you’re finding you’re just straightening your leg and your low back is starting to pull up, that’s the level that you have to start pulling back at. Don’t allow yourself to cheat, okay? As you get stronger, you will be able to hold lower and lower until you’re able to hover just above the ground and back up. But if you allow yourself to cheat, you’re never going to allow your muscles to get stronger. So good luck with the elite level abdominal leg drop. If you want to continue on your journey and want more abdominal exercises for osteoporosis, check my page dedicated to core exercises.